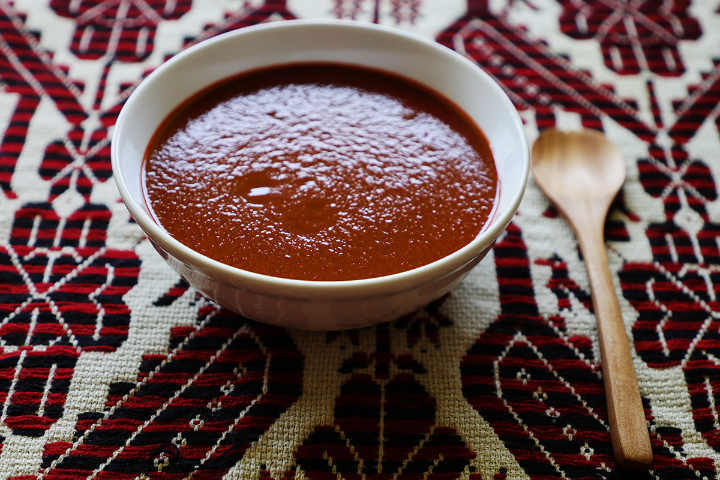 Try this very simple salsa made with guajillo chile peppers, a mild dried chile with a complex fruity flavor. 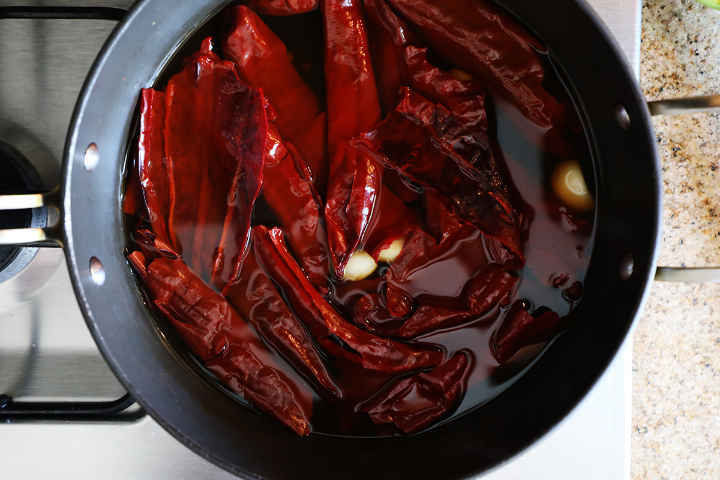 It is one of the most popular chiles in Mexico for making salsas. 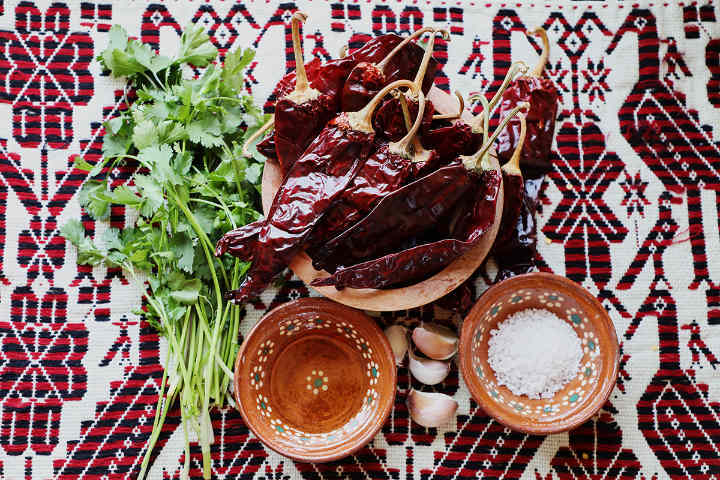 In this recipe, the chiles aren’t toasted as they are in many other salsa recipes which allows the flavor of the guajillo to come through. Don’t like your salsa too hot? This is a good one for you, rich chile flavor but with less burn. This a versatile salsa that goes well with many dishes. 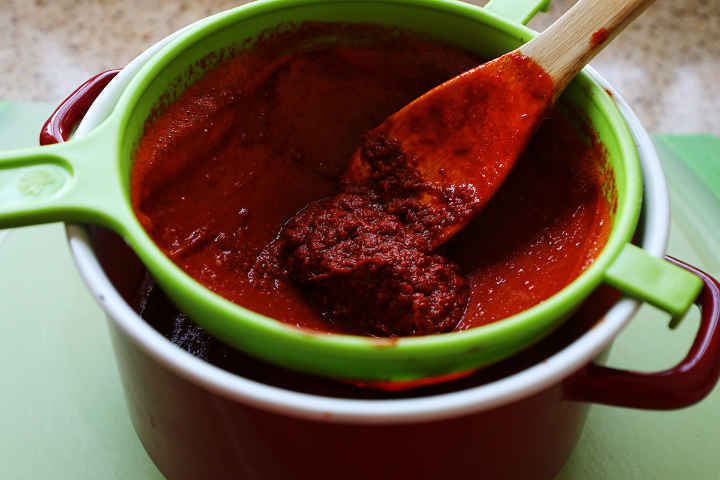 Try this guajillo chile sauce on tacos, enchiladas, chicken, scrambled eggs or on cactus salad. 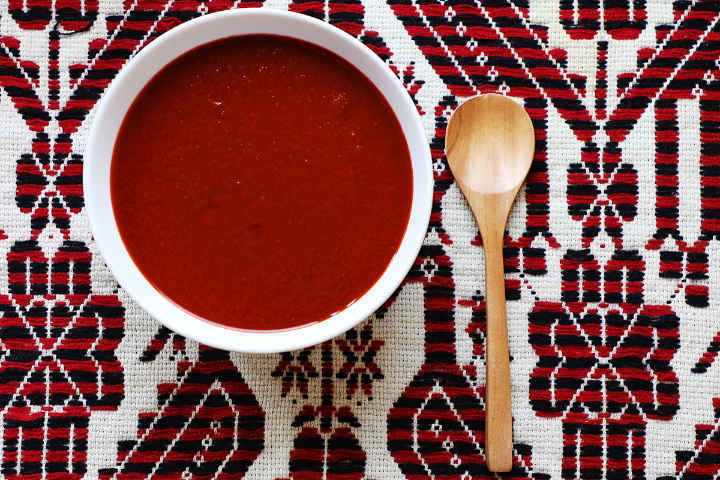 This type of salsa is typical in the state of Guanajuato. It’s perfect for making enchiladas mineras. Choose peppers that are soft and pliable that have a mild fresh fruity smell. 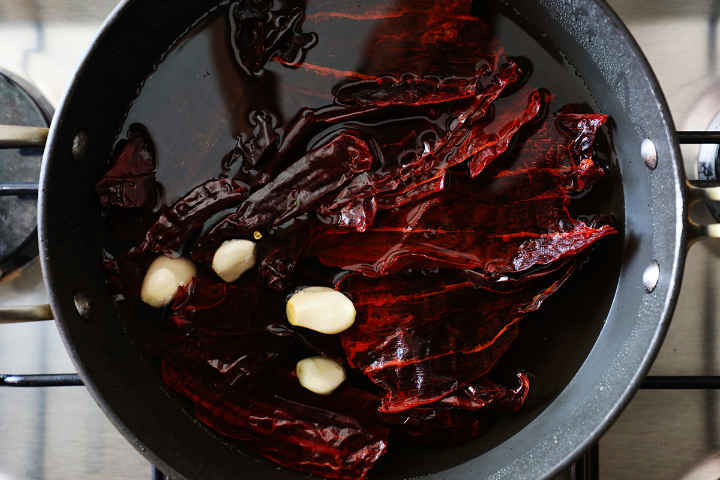 Brittle chiles are stale, lack flavor, and may be bitter. Learn more about how to choose them here. Put all the ingredients in a saucepan. Add just enough water to cover the ingredients, about 2 cups. Bring the water to a boil then reduce the heat to low. Simmer for 1 minute then turn off the heat. Allow the ingredients to soak for 15 minutes. Notice how the chiles have absorbed water and changed color after the have reconstituted. Pour all of the ingredients including 2 cups of the soaking water into the blender. Blend until smooth, about 2 minutes. Add a little soaking water if needed to blend. Strain the mixture back into a bowl. Press the remaining pulp firmly with the back of your spoon to release all of the flavor. No it’s time to season the sauce. You do this by frying the base in hot oil. Start by heating a pan to medium hot then add 2 tbsps. of cooking oil. Pour the chile base into the hot oil. Add up to 1 cup of soaking water to get the desired consistency. At this point, the sauce will be a little bit runny and will lightly coat the back of a spoon. It will thicken as it simmers. Season with 1 tsp. of salt. 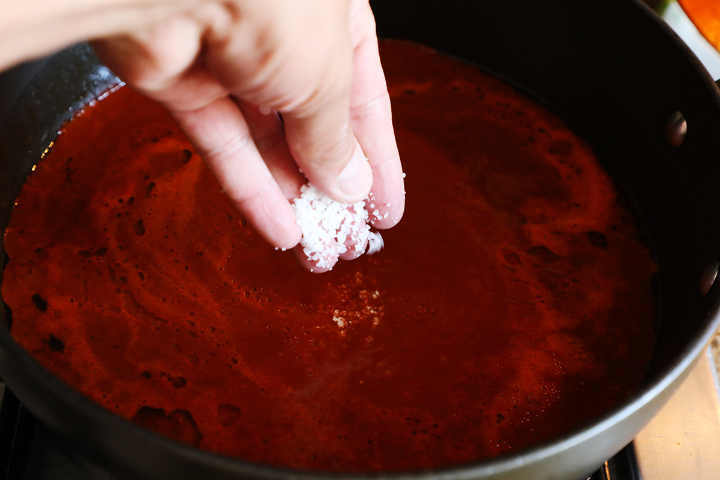 At the end of cooking, you can add more salt to taste if needed. Turn the heat to low then simmer the salsa for 30 minutes until it thickens. At this point, the sauce will coat the back of a spoon without being too runny. 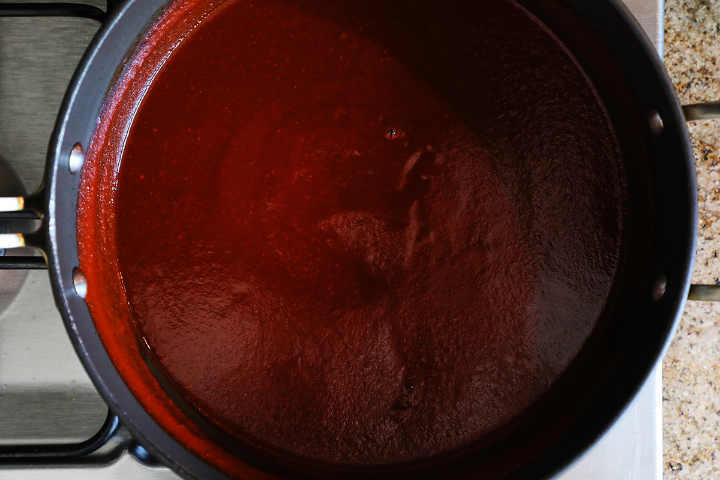 The salsa will take on a beautiful dark red color during simmering. Looks delicious, doesn’t it? 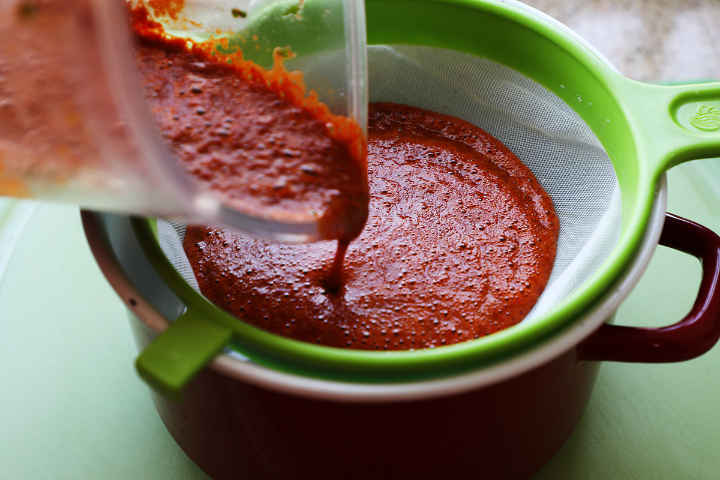 Let the salsa rest for at least 2 hours before serving to allow the flavors to come together. Try not to skip this step. Resting 4 to 6 hours gives even better results. If the salsa is too thick, add 1/4 cup of water at a time until the desired consistency is reached. 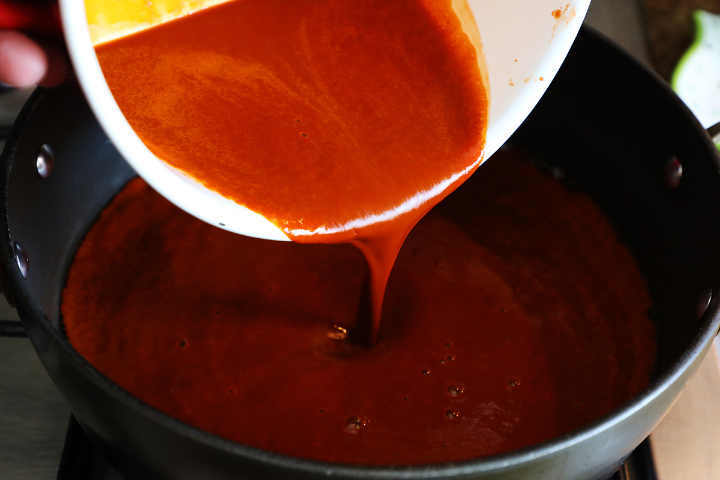 If the salsa is too thin, simmer until enough water has evaporated until the desired consistency is reached. 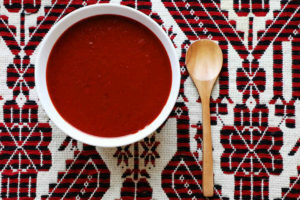 If you find the salsa to be too bitter for your tastes, add 1 tablespoon of sugar to reduce the bitterness. Provecho! Let us know what you think of this recipe in the comments below. 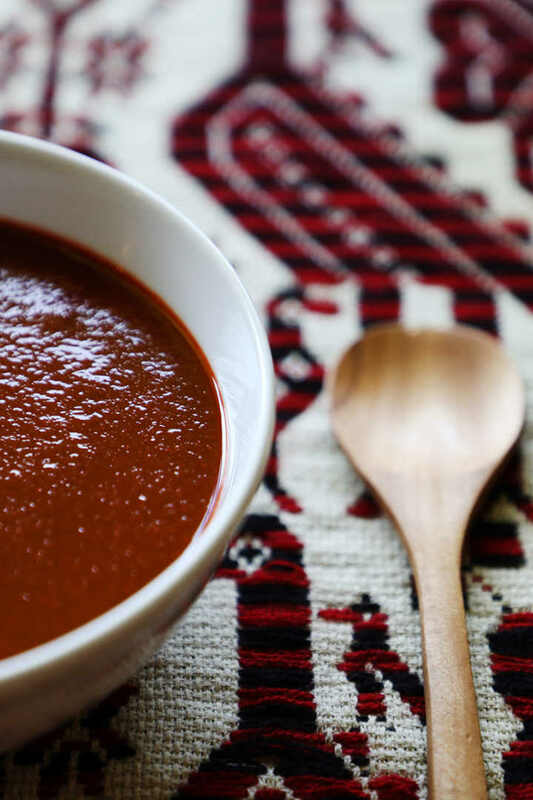 Easy, simple Guanajuato style salsa recipe made with guajillo chile, a mild dried chile pepper with a complex fruity flavor. Great on tacos, enchiladas, chicken, scrambled eggs or on cactus salad. Put all the ingredients in a pan. Pour all of the ingredients including 2 cups the soaking water into the blender. Blend until smooth, about 2 minutes. Add a little water if needed to blend. Strain the mixture into mixing a bowl. Discard the paste that remains in the strainer. 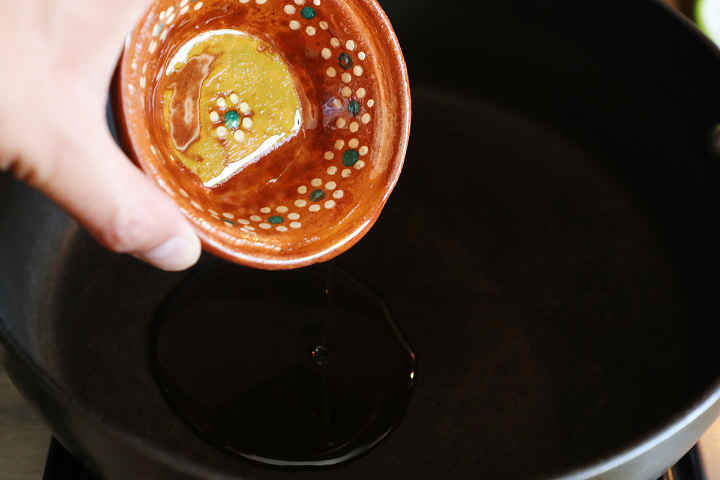 Heat 2 tablespoons of cooking oil in your saucepan over medium heat then add the strained salsa and 1 tsp. salt. Turn the heat to low. Add up to a cup of soaking water to get the desired consistency. Taste the salsa and add salt if needed to get desired taste. The flavor of the salsa will deepen if you let is rest for a few hours before serving. This salsa freezes well. Portion it in freezer bags and it will keep for up to 2 months in the freezer. I think it would work well with beef tacos. Give it a try and let us know. Cheers! “Yield 8″… 8 what? Cups, ounces, years? Servings. 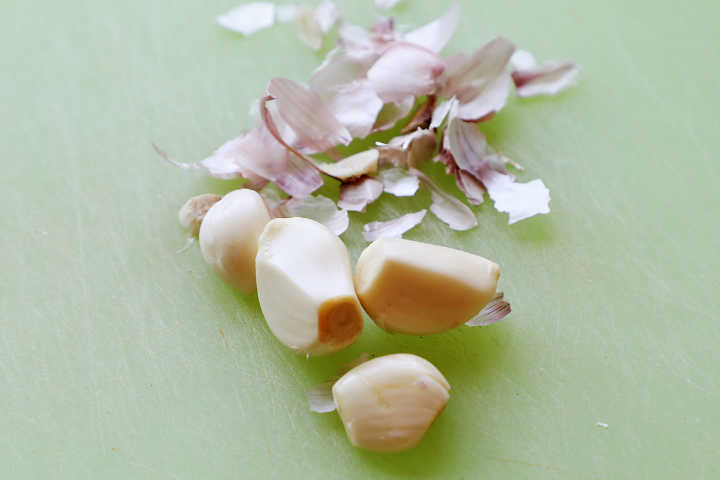 The amount of water you use, the size of your chiles, and the amount you reduce the sauce will all influence the physical measurements, but the serving size of 2 chiles and half a clove of garlic per person remains the same. 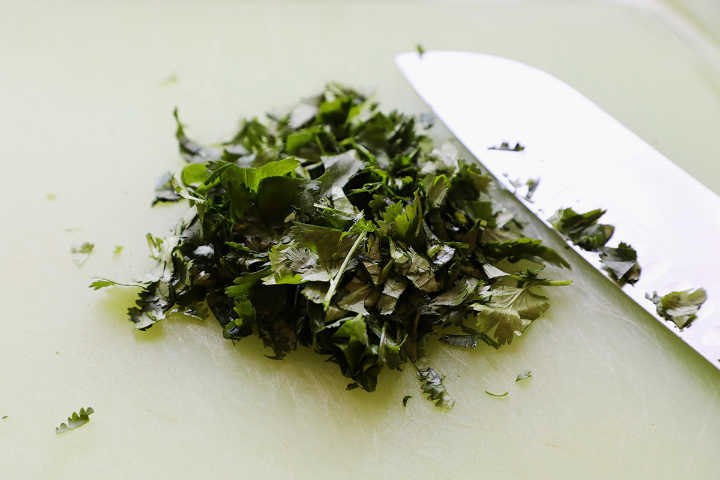 Can dry cilantro work in substitute for fresh cilantro? Since the guajillos aren’t toasted, I don’t see how they might become bitter. Am I missing something? 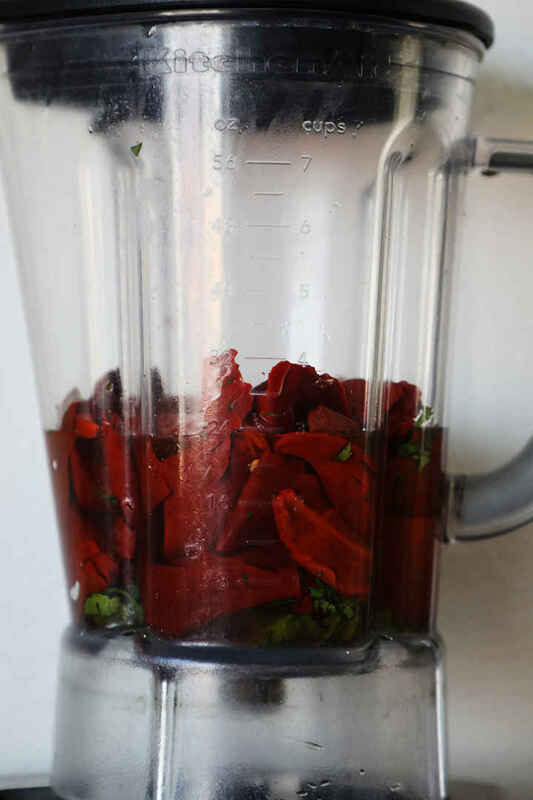 Is there any particular reason you don’t just scrape out the peppers and leave the skins out of the blender, I was told the skins are what’s bitter? The blending and straining process gets most of the tough outer skin. Guajillo chiles don’t have much meat on them. Even after reconstituting, it is difficult to scrape the flesh out. 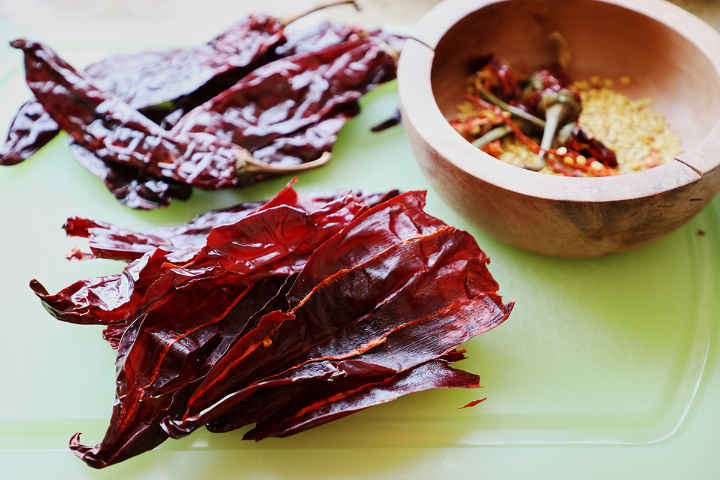 These seeds from the Chile’s can also be saved. Toast them in a medium hot dry pan, until slightly browning, together with some coriander seeds and some cumin seeds. Then ground them and use them in this salsa or save it for some other salsa. It gives a very nice taste.